So I had to wait for the stinkin' phone to charge, ya know......just in case, (I shoulda went out 80's style! ), and that pushed the depart time back to 9am, or almost to then. I didn't get too persnickety about the exact timing of the ride's start. When I did get going, the radar didn't show a lick of rain near us, so I thought I may get away with a dry ride after all. First thing- I had to get out of town. That means a fair bit of urban riding- about five miles worth- just to reach the outskirts of the city in any direction I go. This time I was heading North. The debris from Winter's passing is everywhere, and one needs to be careful when cornering, and watch where they are riding a bit more closely now due to that crap on the road. Cornering hard is generally not advised due to all the salt and sand residue, and trash is about a foot to a foot and a half off every gutter, making punctures a very real possibility. The maintainers have left fresh gravel already. Once out of the clutches of the grimy city, I passed into the climbing hills North of town and found that the rumors of fresh laid gravel were true enough. I ran across a lot of it, but it was only a slight nuisance since it was a finer limestone which the Challenge Almanzos were okay with for the most part. There was a slight tail wind, but otherwise it was quiet and gray out in the country. I decided to head over on Mount Vernon Road to catch the return leg of the "normal" 3GR route and ride it backwards. I didn't think anyone else would ride this day, but it was looking decent enough, and I wasn't cold and I didn't mind the slight windy conditions, so I was pleased with my attempt at that time. However; I hadn't gone up Mount Vernon Road very far before I felt moisture on my face. Okay, okay! Maybe this ride would have to be cut short. Well, I wasn't about to decide to stop and go home, and a very pressing matter was at hand before I went any further up the road. I needed to stop for a Nature Break. Too much coffee! A nice fence row along a low spot in the road away from most farms in the surrounding area would suffice. Once that was taken care of I headed back up Mount Vernon to the West and I was still getting "misted" by this drizzly moisture. It wasn't even enough to get me wet, it was just annoying. I found Streeter Road, the return road for a typical 3GR, and turned North up it. Along about this time I thought about how doing a regular route in the reverse direction gives the route a totally new and different feel. I saw things I really had not noticed before, even though I had been down Streeter Road Southward a bunch of times before. I had a different experience on the bike as well, since down hills were now uphills and vice versa. I actually saw things right near the roadway that I had missed all along. Quite shocking, actually, but when I thought about it, I could fathom how I was missing these obvious sights. Then I noticed another thing- that was the rain which was gone. I didn't miss it, and I also noticed a definite lightening up of the atmosphere as well, telling me that the lower clouds that were producing the precipitation were departing and I was hopeful once again that I would escape getting drenched out far from home. The roads continued to be dry, dusty, and maintained in many spots now with a deeper layer of fresh- but still finer- gravel which made the Almanzos bump and twist as I went down the road. I knew I was working harder due to the skinny tires, but they are far more capable shoes than one might think for a 31mm wide bicycle tire. Time for another Nature Break! However; I think I found the limits of the Almanzo Open 30 on this particular ride- more than once- and that was more than I wanted to find out! I got into the hillier portion of the 3GR route and the downhill runs see some speeds from 25mph to 30mph easily. I was sketched out a couple of times when the bike would jump and skitter on the gravel at those speeds. Then, a bit later on over by the Scout Camp, I was making a lazy right hander and the front end stepped out on me. The Almanzo chattered but I was barely able to ride it out. That was a close one! Further up the road I experienced more stepping out, this time it was the rear wheel, and this was in what I would term as "normal" gravel conditions for around here. Nothing unusual. I tell ya, I wanted wider rubber with its stability more than I wanted the ultra-fast, lightweight, narrow tires I had on. One time I thought the rear wheel was going to swap ends on me. There is a reason you really don't want skinny tires in certain conditions, and this just cemented the reasons why for me. But these tires are awesome on finer gravel and smoother, worn in sectors of gravel. That isn't what we have around here for the most part. Those conditions are rare for around here. I certainly understand that others may have the "right" conditions for these tires though, so I do take that into consideration here. I turned to the South and saw that the sky wasn't looking very friendly. I was also bucking a headwind of about 10-12mph. Now the drizzle kicked back in, and I had it for the rest of the ride. Although this part of the 3GR route is pretty flat, it runs in the Cedar River Valley flood plain, which is predominantly sandy soil. The gravel roads here reflect this and are typically looser and drier when the sun has been out. While the sun wasn't out this day, the roadway was worked over by frost that had come out and the recent grading. The Almanzo tires were cutting into this, making headway into the wind even harder. There just were no real firm tracks to follow until I was well on to Leversee Road, and then it was much better going. I ended up coming in on the bike path around the lake but it was punctuated with a couple stretches of icy, snowy pack, which forced me off the bike. I imagine that will clear up within a few days. I then headed off to down town Cedar Falls, made my way along the back streets, and then about a mile from home, the drizzle turned into an outright rain. I stopped and got my windbreaker, which is mildly rain resistant, out and threw it on for the last run up to the house. All in all, it was a good 3.5hr ride and I feel pretty good about doing the Renegade Gents Race next weekend. Which, if the weather forecast is correct, will be run in similar conditions as today! Okay, I sent a bunch of e-mails out two weeks ago concerning the Pre-Race Meat-Up and I have gotten timely responses from most of the roster. But for whatever reasons, I have not heard from a small number of folks. These people need to contact me via e-mail or through the comments here to indicate that they are coming to the Pre-race, or not coming to participate in T.I.V9. If you know any of these folks, please get them to respond to this call. 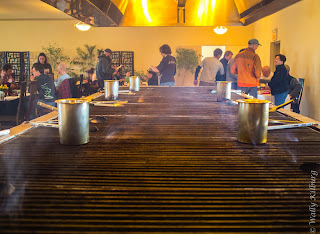 I need to have a head count and menu list in to the Grinnell Steakhouse by Monday!! Time is winding down to the start of T.I.V9. I have a big final route check in two weeks followed by the final cue sheet printing, sorting, bagging, and the getting ready with my re-route kit. I need to sort out sponsorship details, and prizing. I need to confirm finish line details with my volunteers there. I also need to detail out the jobs for the volunteers of the event. Busy busy! And if you find out that you've made a decision to not attend, please let me know! Here is my e-mail link. Got T.I.V9 jitters? Are you confused by all this Trans Iowa nonsense and want some answers? Looking for some way to be entertained for an hour or so? This show is going to be forum style and we want other past Trans Iowa riders and current people on the roster to chime in. We'd love to hear from others that love riding gravel. Call in and share! Guitar Ted is the man behind the Trans Iowa curtain. He spends countless hours of his own time to concoct one of the toughest races in the country. Salsa Cycles rider and frequent MBR guest, Tim Ek, will join the show to answer my rookie questions. Guitar Ted will give both me and Tim Trans Iowa knowledge tidbits. While I have a lot of endurance racing experience, I'm racing Trans Iowa for the first time and have some rookie thoughts and questions and I'm going to pick their brains for the answers. Sound interesting? Check in on Wednesday April 3rd at 8:00pm Central. Call up and Tim and I would be glad to answer questions or comment on anything T.I.V9 related. There has been a big dust up concerning a "big box" retailer making a fat bike for $200.00 retail. 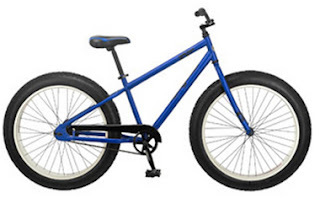 Many fantastic and nonsensical claims have been put forward by several online posters and Hottentots of the blogosphere ranging from "it is the end of the fat bikes trend", to "it's nearly as good as a $1700.00 fat bike for far less money." Ah......it's a Walmart bike with enormous wheels folks. Not that this is a "bad" thing, necessarily, but it is what it is- nothing more-nothing less. It has, (even from the perspective of fat bikes), very heavy rims and tires. It has one gear, and a fairly tall one at that. It has a cheap coaster brake. The frame is mild steel. Called the "Beast", it weighs significantly North of 40lbs. From the standpoint of making Surly, Salsa, Fatback, 9 Zero 7, and Sandman look bad for being "sooo expensive", and for that being some kind of criminals for charging so much money, as some have been claiming, I find that argument rather weak. If that is the case, then all big box bikes are really where the value is at, right? Why are any specialty bikes "so damn expensive"? Because they are far better bikes for special tasks and people are willing to pay for that. Period. I used to work in the jewelry industry for a decade. Talk about a tough sell. How do you sell a shiny rock that is the size of your thumbnail for $35,000.00? (Which yes- I have done before.) By convincing someone that it is worth that. Whatever people are willing to pay, that is what it is worth. So- there is always that factor. Then you have "perceived value", which can be based solely on a belief, or on demonstrated "benefits". So there is also these things. In all these, the specialty fat bikes are "superior", and therefore, "worth it" for folks to buy, just like a Yeti SB66 is "worth it" to buy over a Mongoose XR-200. Or not- in which case the big-box bikes suffice, and you get what you get. 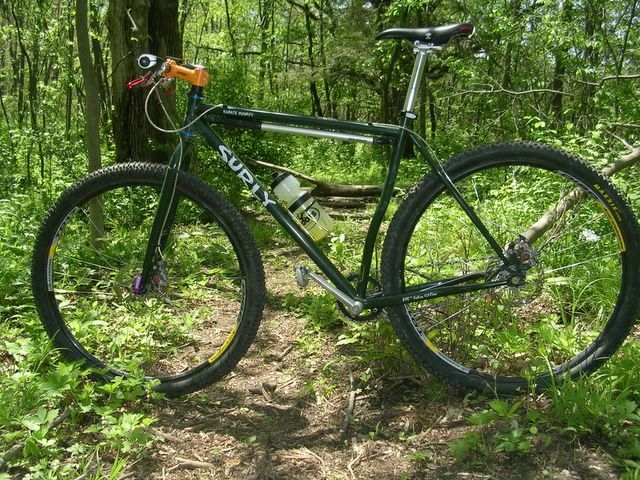 Someone posted on-line that they swapped tires out on the Mongoose fatty and severed 7.5lbs going to Surly treads. Is anyone surprised by this? You shouldn't be, if you are even at least casually aware of big box bikes versus specialty retail. Again- some folks are totally going to love this bike and will understand it fits in at a certain "level", but all the pundits and punters making these grandiose claims are just plain goofy. It's a bike. A cheap, big box brand bike. That's all, really. Anyone remember these gravel group rides I did last year? Yes? Well......they have already started again! Last week I didn't know it was a 3GR ride until it was almost over, but thanks to Mike, he "conned me" and I fell for the ruse. So it was that last week, unbeknownst to me beforehand, I did my first 3GR of 2013. Saturday looks to be a possible rain day, but I don't know when it might for certain. It looks as though it may rain around noon. As I would want to be beating the rain, I think I may start from Gateway Park at 7am. The call will be made on "game day"! So, if you want to get ahold of me, I can be reached by e-mail, (found here), and we can work something out, otherwise I'm going solo. 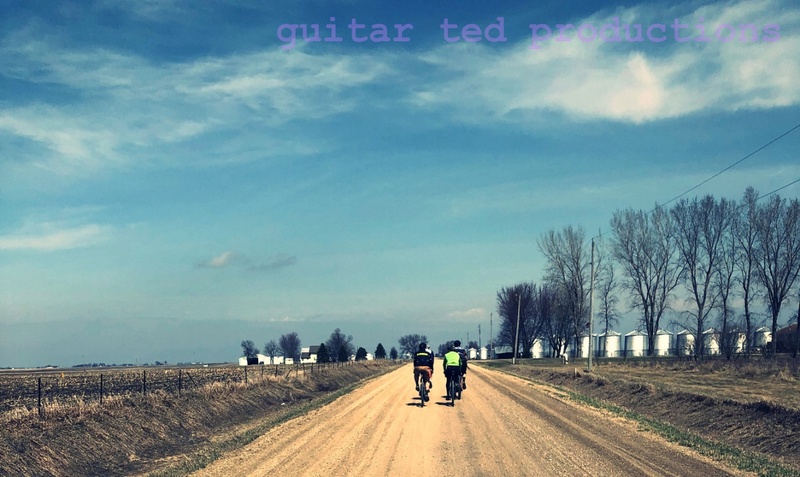 There will be a regular Saturday ride from here on out with a few exceptions, a couple of which are coming soon in the form of the Trans Iowa weekends on April 13th-14th, (final recon), and on April 27th-28th for the event. Also, the next weekend, (April 6th), I will be doing the Renegade Gents Race in Ankeny. So, pretty much every weekend in April but the 20th-21st. Otherwise it looks like this 3GR gig will take off again every Saturday at 8am from Gateway Park in Cedar Falls unless weather prevents this, or the route is changed. Look here every Friday for word on what is going to happen. As posted earlier in the week, I had a nice 40 miler on the Vaya and here is an updated list from the last time I detailed out my thoughts on this bike. BioPace Ring: Didn't even notice it. The gear is good. I don't see changing this out unless at the time I swap to a new chain it does not mesh with it well. Does it help? Hmmm........the jury is still out on that one. Winwood Fork: I think it is pretty smooth. Is it better than the steel fork? I do not know since I have never ridden the original fork. I will do that at some point. I will say that the X-C-X tires at 1.75 fill almost all available space there! Shifting: Last update I stated that I thought the 10 speed shifter,cassette and 9 speed SRAM X-9 rear derailleur were going to be good. I was wrong. That was a pretty marginal set up that I knew would drive me nuts if I didn't have spot on shifting. I switched the rear derailleur to a SRAM X-9 10 speed version. Shifting is perfect now. The lesson here is that the 10 speed stuff can not be matched perfectly with 9 speed parts. Other: Besides the seat post upgrade planned, I may do a saddle as well. I may not. That Velo cheapo saddle is pretty comfy. The tires are pretty good, and I figure these are max size for the bike. In drier weather, Summertime, and Fall, I will run something less big, unless I do Kansas type gravel. I'll end up putting the new Panaracer Paselas on there for awhile. Those are listed as 37mm tires. Great size for the drier weather we should have coming and big enough to deal with chunky gravel that surely will be showing up soon around these parts. I will likely be running the Paselas at the Renegade Gents Race, so I will have a good handle on how those work after that event. In the meantime, the X-C-X tires are going on the Gryphon tubeless. That should be pretty good. Maybe I'll get a Vaya Travel instead! March 2003: After reading about "29"ers" for the past three years I had decided that I was going to dive in head first. 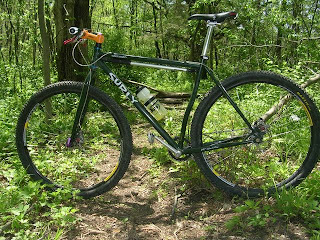 I needed to fund my little project I had conjured up though, and to do that, I decided to sell the only working mountain bike I owned at the time: A 1996 Bontrager Race with original Bontrager offset crown Rock Shox Judy fork. It was a hard decision. I loved the Bontrager. It was a dream bike build with the exception of the wheels, but the wheels were kind of cool. The frame was dark, rich purple, and it came with yellow panels with red lettering. It had a genuine Bontrager stem. I had a purple American Classic seat post on it, purple Paul Motolite brakes, a black Race Face 180mm crank set, and those wheels were Cane Creek Chrono wheels with the wild looking hubs. At the time I decided to sell the bike, I had Michelin Wild Gripper tires on it- the green ones! I was selling it down the road for an unknown. A 29"er, of which I had not actually seen, nor ridden any examples of ever. I had read enough to be convinced of it though, so with not just a little trepidation, I grabbed the $500.00 in cash and watched a fellow load up my prized bike in his truck and drive away. That was in February of 2003. Sadly, only months later the bike was stolen from its new owner and never seen again. But I was scheming up a new rig. I first heard about the Karate Monkey when after the 2002 Interbike trade show, the news spilled out on the nascent 29"er scene online that Surly was going to put out a steel hard tail version of the 1 X 1 with big wheels. Then the name came out: Karate Monkey! Are you kidding me? It is still probably the coolest name for a mountain bike ever. I had to have it based on the name alone. Fortunately I had worked at my new bike shop position long enough that I was afforded the "employee discount" on the frame and fork purchase, plus the bits and pieces needed to get the thing up and rideable. There was much sweating of details concerning which parts to get, and not only that, but much to think about in terms of which size frame to order. This just about caused me not to get a frame and fork, but I finally made a decision. The thing was, the way mountain bikes were sized was evolving from when I had gotten my last bike, back in 1996, as you might recall. In 2002, things were shifting to longer top tubes and shorter stems, ala Gary Fisher's "Genesis" geometry, which many companies were adopting. I was kind of torn between an 18" with a slightly longer stem, or the 20" with the then "new school" shorter stem. Keep in mind that to me circa 2002, a "short" stem was anything less than 135mm! Next Up: The Karate Monkey gets built: The Original Build. It all started yesterday when my son questioned me about a camera bag hanging in my daughter's closet. I thought he was mistaken, because I didn't have any remembrance of a camera big enough to need a bag in any part of the upstairs of our old house. Well, my son, not wanting me to think he was pulling my leg, offered to go get it. Whattaya know! It was a camera bag with a 35mm camera and a spare zoom lense in it. Hmm.....must belong to Mrs. Guitar Ted, I figured, but I had no recollection of ever seeing it before. So I researched it on this thing called the internet and I found out it is an East German manufactured Practica ML 2 with kit lens, and packaged with a Korean made Hannemex branded zoom lens. Found out later the shutter is hanging up on it, but otherwise it should be fine. This got me to thinking, "Hey! Isn't there a Canon lurking about as well?". Yes. There are two Canons, in fact, and one I actually bought with Mrs. Guitar Ted right when we got married. It is the EOS Rebel with kit lens. The other is a Canon AE 1 with its lens. I know there is a story behind that AE 1, but I had forgotten all about it until yesterday. I'm not sure it even works right. Then there is the curious little Sears and Roebuck zoom lens. Turns out that was one given to me by a former coworker years ago, and is a decent lens, but nothing spectacular, as far as camera lenses go. Still, I had no idea I had this much camera stuff sitting around the house. So the obvious question is, "What are ya gonna do with all that?" To which I have no clear answer right now. I figure it all needs to be looked at by a professional camera shop so I can determine whether it is fit for use, or to much money to fix, or whatever. Thing is, our camera shops have all disappeared, so I have no where local to go these days. But I do have some camera aficionados for friends out there, so what can you tell me? Spring Training: Was That a 3GR? Saturday was going to be a planned test ride for the new-to-me Vaya. It also was a test ride for the Vee Rubber X-C-X tires, (which you can read more about here if you want to.) I was on Facebook when I saw some chatter about folks wanting to ride gravel and Mike pinged me about my plans. Next thing ya know, Mike is coming over to my place to meet me for a ride, and Jeff decided to join in as well. The ride time was set for 10am, since it wasn't all that warm and I didn't want to ride in temperatures in the teens. It was forecast to get into the 30's a bit after noon. So, Mike showed up and then Jeff came along about 20 minutes afterward and we set out to ride Southward. I figured an attempt at Ansborough would be good. It goes on for about 12 miles and you don't have to make any decisions for a while. The rollers are there to make it interesting, and aren't so bad that they crush you out of the gate. Just enough to wake up the legs, as long as the wind is not out of the South. As we reached the "T" intersection at the end of the road, (now "U Avenue" in Tama County), we had some decisions to make, so we stopped briefly again. About this time a red Chevy truck pulls up with this enormous shaggy, blonde colored dog in the back. By the looks of it, it would appear that it was a Wolfhound of some sort. The driver rolled down the window, truck blocking the entire intersection, and says something in an unintelligible mush-mouth. Then I noticed he had very few teeth in his head. (Not that this indicts him in any way, but it explained the poor diction.) Finally it came to me that he was making some jest about not having a motor. I acknowledged his "cleverness", which he seemed rather pleased with, and he rolled up the window and trundled off to the East, the dog in tow in the bed of the truck. Thankfully the dog took no notice of us. I'm quite sure it was large enough to have taken any one of us three out if it had a mind to. But that still left us with our decision on which way to go. After outlining our choices, it was agreed that we should go West and we ended up going by Buckingham on the pavement. I always had wanted to go by Buckingham, just for the personal pleasure of having "bagged" another small town on my bicycle, so that was a highlight for me as we rolled by the tiny burg. Then it was a couple more miles to our Northward trek back up P Avenue which, as any Tama County road is, was hilly, and mostly up. Added to this was the fact that now we had a slight head wind to push against as well. Barns For Jason: Another view. The conversation helped me focus on something other than my aching knees and legs which were being pummeled for the third straight day. At least the roads were shaping up, and some grading was noticed here and there, so we knew that the Counties had been out shaping up things after the snows and frosts of Winter. Well.....Winter isn't letting go quite yet! But everyone is waiting for the Springtime weather to pop like dam that is about to burst. Speaking of which, I noted more Red Winged Blackbirds again, and a couple days earlier the Robins were congregating, so it all hinges on the weather, and when it does turn, I think Spring is going to "explode" in many different ways. I also have a feeling that Summer-like weather will be right on its heels, so I wouldn't at all be surprised if drought and dryness continues in Iowa. But that's another story. Back to the ride- Mike at one point mentioned that this was the first 3GR of 2013. Wow! I hadn't even given thought to that, but he was right, of course. It was a 3GR, and it was an awesome 40 miler with good company. The Vaya was good. Really surprising, actually, and I feel it will need some very minor tweakage to become a solid rig in the stable. So that was the end of a three day brick of riding. Sunday was a day off, and my legs were aching the good ache of having been out on a bicycle consistently. Hopefully with a turn to better weather the consistency can be kept up and I'll be good to go for the Renegade Gents Race. Last weekend, I was supposed to leave for a Texas vacation, but due to circumstances with our vehicle, the trip was scuttled. So, I devised a plan to do as much riding around here as I could. Trouble was that the beginning of the week was super windy and really cold. Like January cold. I just wasn't ready to go out for miles in that stuff. But the latter part of the week warmed up, (barely), enough to get me out there. I've already detailed my Thursday excursion, and on Friday I made another attempt at a ride. I was curious about riding in an area I haven't been in yet that was very close, but far enough away that I went with a shuttle run in the "Truck With No Name" to recon where I would start out from exactly. I waited until the afternoon to get the maximum heat from the day, and headed out towards Hudson and drove around West of there to find a good place to start. I finally just ended up parking right in town and changing into my cycling shoes and booties. The route was up out of Hudson to the West on Watters Road and taking the first right hander off that, I headed out onto the gravel. What I found was completely different than what I found out on last weekend's ride. The roads were dry, hard, and fast. The traffic count out here was way up too! Lots of big farm trucks and semi tractor-trailer rigs going to and fro. Apparently, the farmers are getting ready to go out and plant soon. No surprise, as last year most of the corm had been planted by now or was being planted about this time. No farmer has set an implement to a field yet around here this year. The dust was a bit surprising, and I found out later that I and my bike were covered in a fine coating of gravelly goodness. I suppose getting doused by a few of those trucks that passed by with their dust contrails was the reason for that. Even my beard, which has grown pretty long over these cold months, felt like it was full of gravel dust when I was finished with this ride. At any rate, it was fun to ride on something a bit different than what I was normally used to, and I will have to add a route going out this way to Dike or something later on just for the fun of it. The roads have a few decent rollers, but looking westward, it appears that the hills flatten out a bit in Grundy County. Still, these are unexplored roads for me, and I look forward to checking them out now. More on Spring Training tomorrow. Trans Iowa V9: So, What Is Allowed For Support? In the case of Trans Iowa, it has NEVER been allowed that riders receive outside support. You might note the post date on the rules on the Trans Iowa site. Yep- that's right, posted by "Jeff Kerkove", who wrote those rules out in 2004. The thing is, folks have sought to circumvent that basic tenet of Trans Iowa ever since. My challenge is to provide a fair and even playing field for those who are willing to take up the challenge of Trans Iowa. To my mind, that has meant the changing, tweaking, and clamping down upon enforcement of rules and the allowances for "support". In the case of Trans Iowa, you must source your own pizza, ride devoid of fans, onlookers, and people you know cheering you on, and depend upon your decisions to either see you through to the end, or to make the right choice not to endanger yourself and others. In this you would be riding according to the spirit of the event. This sort of honor amongst riders can not be totally enforced by one individual, (me), but it must be an unsaid agreement amongst all of the riders. It must be enforced by you and the others, holding each other accountable out there. There will be cheaters, and those who try to bend the rules to make things easier to accomplish, but they will have a hollow and meaningless reward if they choose that path. I can not, nor can my volunteers, be expected to have 100% success in seeing that the rules are followed due to the nature of the event, but we will DQ anyone we see that has been receiving outside support. We will ask tough questions if it comes down to that. Thankfully, I haven't had to do anything of the sort.....yet. We have checkpoints and at those checkpoints we have sponsor's product which is free for the taking, but it isn't a guarantee. I don't send folks out to suffer unnecessarily either, so I do route past convenience stores, and in the case of last year, where there was a stretch of well over 100 miles without a chance for resupply, we allowed a checkpoint with food and water. That will not be necessary this year. But the point is, I try to provide each rider with fair chances to get what they need on the route I devise. Okay, I kind of got on my soap box there, but this means a lot to me and others who have ridden Trans Iowa. It means a lot to those who have gone on to finish similar events like the Arrowhead, Tour Divide, and the Iditarod Invitational. I hope you understand.
" 4:Pre-arranged outside support is not allowed. This includes, but is not limited to assistance with navigation, delivery of supplies, lighting, or lodging." There you have it. Any questions? Ask away in the comments section. Thanks for reading! Well, the pity-party I was having about the weather wasn't going to fix what ailed me. No- I needed the good medicine- a real bicycle ride to clear the mind and soul. So that's just what I did yesterday and I did it on By-Tor the Titanium Mukluk. It was darn cold in the morning, I think something like 7°F- but the sun was out and that brutal wind we've had for three days was gone as well. Good riddance too! This time of year, if the sun is out, 25°F feels a lot warmer than it does in January. That was the forecast for the afternoon too. Warmer with no wind. I waited till after lunch then to go out. I headed over to the Green Belt, and I didn't know what I would find there. Snow? Ice? Flooding from the recent ice jam? Well, it turned out to be mostly everything but with the exception of the flooding. That had gone away, thankfully. In fact, it is surprising to see how far down the creek has gone already. The air felt great though, compared to the previous days of Arctic blasting, and I was enjoying the bright sunshine as I trundled through very nicely packed tracts of snow punctuated with stretches of wet, muddy grounds. The Larry 3.8"ers were slipping a bit- Nates would be nice about now- but I wasn't going to quibble. I was out riding a bicycle, and that was what was important right then. The first leg came to a halt when I ran out of ground and into sheet ice from the flooding. The trail there is slightly lensed out from the years of use and it provides a perfect course for the flood waters to gather when the Black Hawk decides to have a walk about outside its boundaries. I stopped here and picked off a few images. It was deadly silent in this place with the exception of the occasional crashing of ice sheets falling away from tree trunks. The Sun was doing Her work out there, and slowly but surely the patches of snow and ice were melting, despite the below freezing temperatures. I ran across some unfrozen stretches of mud which lay over frozen earth below it and that was some super slickery stuff right there! I am not even sure Nates with there knobbly tread would have done anything better than what I had in those conditions. I turned back and climbed the dike, rode up on top of that until I came to the spot where there is a passage across a small drainage creek to the lake on the other side. I wanted to ride around the lake if I could. However; the creek ice was far too thin to trust, so I back tracked yet again to the dike and went around the long way. Once I got over to the entrance to the lake loop I found nicely packed sections of snow that was decently fast to ride on. There were a few slippery spots of mud where the snow had been roached off by the ever strengthening Sun, but this section was a lot of fun on the fat bike. There were a few places where there was sand as well, which was pretty frozen up and firm yet. Sand doesn't seem to thaw as quickly as black dirt does. It is a good thing that the dirt does unfreeze as fast as it does as the robins are back, and they were concentrated on any sections of bare earth they could find. Then I decided to head back to the shed and that was via the bike path. I hit up every stretch of frozen snow I could, since this will disappear quickly with the forecast warmth to come. I wanted at least one ride on snow that was something other than crawling or post holing/walking. The Green Belt may have been choked off by ice, but I still got a much needed shot of riding medicine yesterday with more to come. First day of Spring, I awake, I hear the wind blowing. I go and check on the weather and the temperature is 10°F. With the wind figured in, the windchill is below zero. So, I am pretty tired of that. I also have extenuating circumstances to deal with at the time, so riding out of doors is nixed. I decided to hunker down in The Lab. I grabbed a couple of projects I had been putting off and started messing around with them. A couple of favors for a neighbor. Another one is going to end up becoming another gravel rig. The gravel rig's genesis was as a touring bike made from True Temper tubing and is lugged. The clearances are generous and the frame isn't all that heavy. It is old enough that it has a threaded 1" steer tube fork, which makes life a little more interesting when it comes to stems. I've got a good plan here though. The bike will eventually end up as a rig to test tires and wheels on. 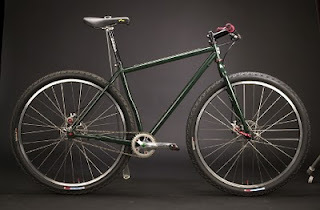 Due to the "mule" status it will have, I am not going to invest too heavily in the parts or the finish of the frame. Yes- the frame is getting re-touched a bit. There was some nasty rust on the top tube, (surface only), and the previous owner had done some touch up work that I figured I would take care of while I am at it. Oh......and I debadged the whole rig as well. I puttered around with that until my hands started to hurt from the sanding of the tubes. The finish will be something that I've wanted to do for a long time on a bicycle. Camouflage. The base color of the bike is green, so I think it'll be the standard woodland camo kind of look, but it should be fun and as long as the thing gets covered in paint, I'm good. I will then have three "skinny" type gravel bikes to test with and ride for fun, obviously. That's probably two too many, but for now I want to be ready for any eventuality with regard to this gravel grinding deal I am getting drawn into more and more. Then if all the bikes work out, I'll have some decisions to make and if a couple don't pan out, I'll have some decisions to make, and if the whole gravel dealio goes up in smoke.....I'll have some decisions to make! At any rate, having three skinny tired gravel rigs is kind of ridiculous. But- it seems that I will actually be pressing all three into service. Until the weather gets better though, I will have to be snapping to it and getting the last rig done here. The other two are all set, and I just need to paint and assemble this last old steel girl, and then I can hopefully emerge from hibernation and get some steady, regular miles in. "300 Miles Of Gravel" To Air On Iowa T.V. You can buy your own DVD copy of this short film here. I believe the cost is $10.00 plus shipping. It's a pretty good deal on a good film that won a Chicago Area Regional Emmy, so it is professionally done. The money goes right to the film maker and he put a ton of time and effort into this piece. The film short will air five days ahead of the ninth running of Trans Iowa, so the timing will be pretty relevant to the viewers, as they can look outside their windows and imagine that the race is happening in the conditions they are living in right then and there. Note: I do not, (nor does anyone connected with Trans Iowa, the riders, or volunteers), receive any sort of compensation for this promotion of the film or for appearing in it. I think the film maker deserves all the credit here for the piece anyway. I hope you find time to check this out if you can get IPTV, and if not, then please consider buying a copy of this film. Thanks! What Price For "Real" MTB Parts? I've worked at a bicycle shop for many years now and I often scratch my head when I see what passes for "mountain bike" parts spec on models that are definitely intended for use off road. The rigors and types of riding styles one sees these parts put through mean that parts are going to be abused to some degree, and that those parts need to be up to the task. Yet time and again I see a bicycle spec'ed with poor brakes, poor drive train gear, and especially poor wheels and forks. It is why I often tell potential riders on a budget that one bicycle is a "mountain bike shaped object", while another is actually an off road-able machine. I recall one particular bicycle model put forth by a well known company a few years back that came out of the box, brand spanking new, with fork bushings that displayed so much slop I wouldn't consider it for off road riding of any type. In fact, now that I think about that, there are two bicycles from two separate manufacturers that stand out in that way to me. Bad stuff. 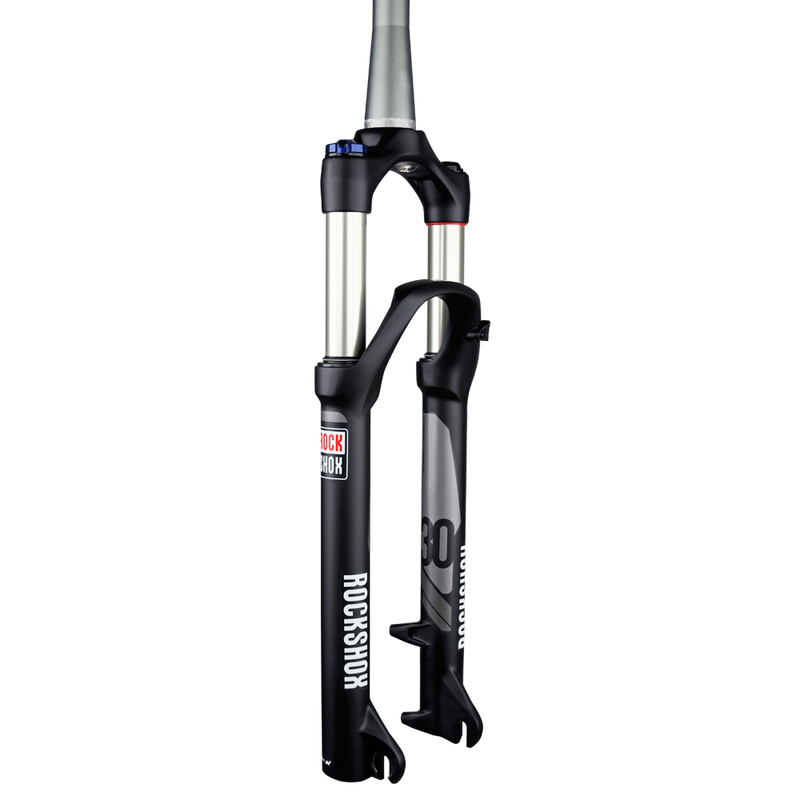 That's why yesterday I was heartened a bit by a press release I got saying Rock Shox was making a fork available which would be lighter and less expensive than some of their other offerings and yet retain the high performance features that the upper end forks are known for, just with less bells and whistles attached. To my mind, a decent suspension fork, along with competent wheels and drive train bits, go a long way towards building customer satisfaction, and maybe a life long rider that will upgrade some day. I think Rock Shox got something right here. They are providing a product that potentially is simple, durable, and requires minimal maintenance.That's what entry level to casual level mountain bikers need. Something that "works" with minimal fuss and input on the part of the owner. 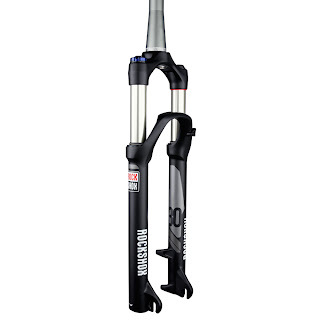 Hopefully Rock Shox gets this model right, and that's exactly what folks will experience with this fork. The fact it says "Rock Shox" on it doesn't hurt matters any either. While "halo" models and high end, new technology parts are a lot of fun to check out, the reality is most folks are on a "beer budget". Big, fancy models that fetch astronomical prices, ($10,000.00 per bike is not unheard of now), are one thing. Forks that cost $700.00+ are one thing, but the focusing attention on all of that by the marketing guys and gals is a bit heavy handed. This news is a bit of fresh air in those terms, and I welcome more of this sort of thing in the future. I looked at the calendar and it said March 18th, but I tell ya, it was more January 18th, what with the howling winds, snow drifting around, and the dive bombing mercury in my thermometer. March? Really? You've got to be kidding me. And it looks as though we'll even blow through this entire month without a single day out of the 40's. It is so weird to think about that. So, I have become a bit annoyed. Grumpy, you might say. My wife has noticed this. I think my kids are on to me as well. I've a feeling I need to be left alone at times to be less of a "Negative Nancy" around others. More sunshine is needed, and more warm air. Less layers, and more short sleeves and ghastly white legs showing. It's just been way too long, ya know? And it isn't just me either. I know riding has been tough. Training for events early in the season has been tougher. I suspect many Trans Iowa riders are pretty sick of indoor trainers right about now. Then you have the cycling businesses. It's been hurt by this stuff too. Last year we were all hands on deck by now and getting further behind. Now we're cruising along like it is February. That isn't good. I keep getting weird thoughts like it must be because I still have my beard. If I shaved it, Spring might come. But then I come to my senses. I even saw a saying the other day online that purported the sign of Spring is when the Turkey Vultures come back. When you see them, it won't snow anymore. I saw three Turkey Vultures Sunday. I had determined in my mind that a few things had come together which were all pointing in the direction of a big gravel ride for Saturday. First- I was healthy again. No niggling cold issues, no fatigue, and no flu-like symptoms. I hadn't felt "right" the entire month of February, and the first week of March was really when I finally started to get on with commuting to work by bicycle on a regular basis again. So, the body was responding again in a way that told me it was time for a ride. Secondly, I had just received a few items to test, one of which is a dedicated gravel road tire called the Almanzo Open 30. I got the tires mounted up on Friday and that was another reason to go out and ride some good gravel miles. But a big reason for getting going was that in less than a month I have a metric century gravel road event in the Renegade Gents Race coming up. I need to get the motor tuned up again, and in a hurry too! Saturday was not starting out the best in terms of the weather. It was grey, slightly foggy, and cold. I could hear a stiff wind buffeting the house. It would have been easier to stay inside and blame the weather, but that wasn't going to get me where I needed to be. So I kitted up, and hoped that my feet would stay warm. The wind was out of the North-Northeast, so I decided I was going to head out in those directions to start out with. After several miles to get out of town, I finally made contact with gravel and I was out in the countryside once again. It had been awhile since I had been on gravel. The first leg went mostly East, but when I finally found a Northward road that wasn't a dead end or a blacktop, I found out that the headwind was a killer. Matched up with the soft roads, I had a heck of a workout going. I was stuck going north for several miles as well, having to pass up a few opportunities that were either blacktop, or were going to turn into blacktop. Once I turned back West I looked at my phone for the time. Wow! I had been out an hour and a half already. This could turn into a much longer ride than I had planned for, since I was thinking that knocking off two hours would be really pushing things for getting back to training. Oh well! I was here, and I had a bicycle. I was going to have to get myself back home. I came across a Road Closed sign, but I wasn't too worried. I figured it was just due to soft roads, or some minor construction, perhaps. When I saw a field South of me full of flood water, I became a bit more concerned. "Hmm....I may be turning back the way I came after all", I thought. The road started to look really rutted out ahead of me, and in fact, I found myself in such a deep rut that the side of the rut kicked my foot out of my pedal! Not to mention that the dirt was so soft I felt like I was going up a steep hill, when in fact I was going downhill! I came up on the reason why the road had been closed, and it turned out to be an ice jam on a small creek. It must have backed up the water enough that the creek overflowed into the ditch and that filled up enough that the water rushed across the road, tearing out some three foot ruts and large sectors of the gravel. Of course, on a bicycle it was no big deal. I went right on by and onward to the West. There some dogs along this stretch of road, but it was so windy and blustery they wouldn't even chase me, preferring rather to stay out of the raw Northerly blast. Even though I was taking the wind at my side, it was a struggle combined with the very soft, sponge cake-like road. I was growing rather tired of this. I was certainly looking for my South road, and it didn't come too soon for me. Although the road surface didn't get any harder, the speeds went way up through the Southward miles. The mighty wind at my back and some decent sized rollers made sure of this. I was making up a lot of time on this stretch and the wind blew me all the way back into town easily. Then it was just a cruise on pavement a few miles back to the house where I walked into my door at precisely three hours of ride time. I had felt pretty good the entire time, but I knew I had pushed the legs pretty hard. I found out later just how hard, as the aches and tireds which were the result of the effort set in. But it was a good day out on the bike. One that was much needed and appreciated. I went out for a 3 hour gravel ride and shot a bunch of barns which I usually post for my buddy Jason. This year we decided that we could only post up images of barns if we went to see them by bicycle. So I guess these qualify. The lighting was odd most of the day with the mostly overcast sky. It was terribly windy out of the north as well, so I had to be choosy about whether I would take the chance to shoot a barn or not. I headed out North and East of Waterloo. It seems that there still are a plethora of small farms out this way. That is getting to be very unusual these days. It makes finding barns hard when the farms have disappeared, for the most part, and are miles apart in some areas now. The snow hasn't given over completely yet. There were even some stretches where drifts barely intruded on the roadway still. All the melting has made the roads soft. I was very surprised that I got this barn at all. I had seen it, fumbled for my camera, and by this time had rolled too close to some outbuildings which obscured my view. There were some gnarly Burr Oaks along the road, which also made the barn hard to see. As I rolled by, I had one chance to get the image, and I was sure I had blown it, but here it is! A "modern day" windmill. There are getting to be more and more of these privately held wind generators in the country. By the way, all shots here are from the saddle as I roll by. No stopping and framing the image for me! I switched to black and white for awhile. The day just called out for it, and this old skeleton of a barn really fits that format, I think. And finally, a rare, old skool windmill. These are also slowly passing away. Especially in working order, as this one is. The traditional windmill, at least in Iowa, is a rarer treat than barns! This post is about the e-mail I sent to the entire T.I.V9 roster last week. Didn't get it? Then ping me here and I'll get the pertinent info coming your way. The e-mail gives you the choices you can make for your Pre-Race Meal with all the other racers and their support folk. It is a good time to get to know some of the folks you'll be toeing the line with, or to meet those folks you've read about, but never gotten the chance to rub elbows with. If you want the sequence of events for the evening of the pre-race, go here. You'll also find the pricing for the menu items that you have to choose from there. There are currently 119 folks still on the roster and I haven't heard back from even half of you yet. Please look for the e-mail titled "Trans Iowa V9 Pre-Race Meat-up" and answer it ASAP. If you can not find it, please let me know and I will forward you the e-mail. Finally, if you can not attend T.I.V9 for any reason, please let me know that as well. Thanks! Social Media- love it or hate it- is here and it works. I had resisted doing anything with Gravel Grinder News specifically in regards to social media for quite awhile. I figured I would just piggy-back it on what I was doing on a personal level. 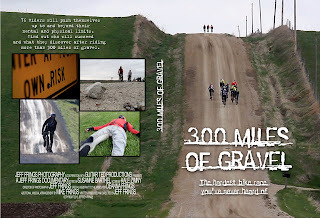 However; with the recent realization that this stuff is getting a lot more attention than I thought it was, I decided not only to pursue a new GGN website, but to start a Facebook Page for Gravel Grinder News. And boy! Was I surprised again. It went to over 440 people in two days that "liked" it. That's just basically "Facebook word of mouth" right there. Pretty crazy, but there ya go. It has a lot of activity going on too, which is again- surprising me. I guess this thing is going somewhere, and I have to decide a few things this Spring. Can't say that it's boring around here, that's for sure! Sometimes I wonder if I need things to actually calm down a bit. Can I Show You To The Door? I imagine I am not the only one that feels Spring is late. Tardy. Out there goofing off somewhere instead of coming around, melting this infernal ice and snow, and warming things up. I like Winter- don't get me wrong, but I also like it when the seasons actually change from one to another. This is getting ridiculous. So, I think I am doing a gravel ride Saturday no matter if it is freezing or not. Maybe it would actually be better if it was frozen at this point! I've heard that the roads have been awful when the Sun gets them unfrozen right now. But either way, I need to get going here because I have an event in less than a month and I need to dial in my rig. Winter has really put a damper on that. Heck, it's been in the low teens in the mornings most of the week here, and only just today did it get over freezing. Tomorrow is supposed to be nice too, but Saturday it will be cold again. At least the roads should be pretty free of ice by that time. Maybe. we'll see. Well, it looks like more gravel related stories today than anything! Here I have the Challenge "Almanzo" tires which are skinny little critters at 30mm, (claimed), and are handmade gems that sport a 260 TPI (!!) casing. Pretty high end stuff here as far as tires go. I also got these Challenge strips of bubblegum. Well........actually they are not bubblegum! Old 90's era mtb freaks will recognize these as latex tubes. Remember those? Yep! and these are light and will be going into the Almanzo tires which will then see gravel duty and be reported on over at Gravel Grinder News. These tires will get mounted up to the HED wheels I reviewed and on a set of Velocity A-23's for good measure for a time as well. I have a plan of attack for these things and if all goes accordingly, it should result in a pretty interesting review. Stay tuned- I'll link to it here once it gets published. Okay, that's it for this edition of News and Views. Have a great weekend, and push some Springtime weather our way if you have some to spare, won't you? Thanks! The days previous to this have been rather odd. It rained all day on Saturday and Sunday, it was supposed to be a terrible snow storm, was a nasty bit of slush. Then it froze solid. This was a recipe for the best fat biking conditions of the, (over stayed), Winter. I rode By-Tor a couple of days to great effect on some nicely packed and very fast snow on parts of my commute. However; the ever strengthening March Sun is not going to lose this battle, and the snow is disappearing, despite temperatures well below freezing. So I decided to break out Project White. The Inbred set up as a single speed, because it is not capable of gears, was sporting some skinny Michelin Wild Mud tires tubeless on new XT 29"er wheels. "Pizza cutter", I thought, as I took off for the snow covered field and bike path beyond it. But as many know, the bike did go on through. Slowly, with much effort, but it got through. It obviously wasn't the same as a fat bike, and that's really the point here. It wasn't as good as a fat bike, if you wanted your ride to be easier, faster, more fun, and longer. Certainly, anyone that rides with regularity could ride a mountain bike on packed snow, as I did. However; the float and control one gains with fatter tires can not be denied. It is faster and more efficient than standard fare. So now for an update on the white rig. It isn't like the old Inbred, neither is it worse or better than the old one. It is different. Quite different. It is a 19"er vs the 18"er I had before, and I do notice the stretched out chassis a bit. Of course, I can adjust with a shorter stem, and I will. The feel of the longer bike is different as well. It seems "planted" yet not "dead" like the Vassago did for me. Otherwise with the addition of a Surly chain tug, this bike is feeling really good now. I will make tweaks along the way, but for now I have a positive outlook on the Inbred. Besides the stem, I plan on switching out the fork at some point, and the tires and wheels will end up being something entirely different at some point. I envision some wider rims and beefy, 2.25-2.4" tires to compliment a move to a possible rigid fork. Speaking of working on single speeds, I have been tweaking on a few of mine of late and will be showing that stuff off soon. My next big single speed project is the old Karate Monkey, which celebrates its 10th year with me this very month. It was my first 29"er, and although I have not spent a lot of time on it lately, it still is an awesome rig. Look for 10th Anniversary Monkey updates to come soon. A couple days ago I decided to hit up Facebook and post a page for Gravel Grinder News. The news spread, and within 24 hours of the page creation there were over 200 likes. Not too shabby, I would say. The site keeps breaking daily hit records all the time as well. It's been crazy. People are turning on to gravel riding and racing, (apparently), in numbers I thought were unfathomable only a year or two ago. Heck, I had no idea at all this was going to happen, to be quite honest. And the events show this as well. Several events are approaching, or are over the 1000 rider participation mark. More new events are happening all the time. I posted a half dozen new events within the last week to the Events Calendar on GGN. Gravel grinding, back roads events, "ultra-cyclo cross", and "all-road" events are springing up everywhere. 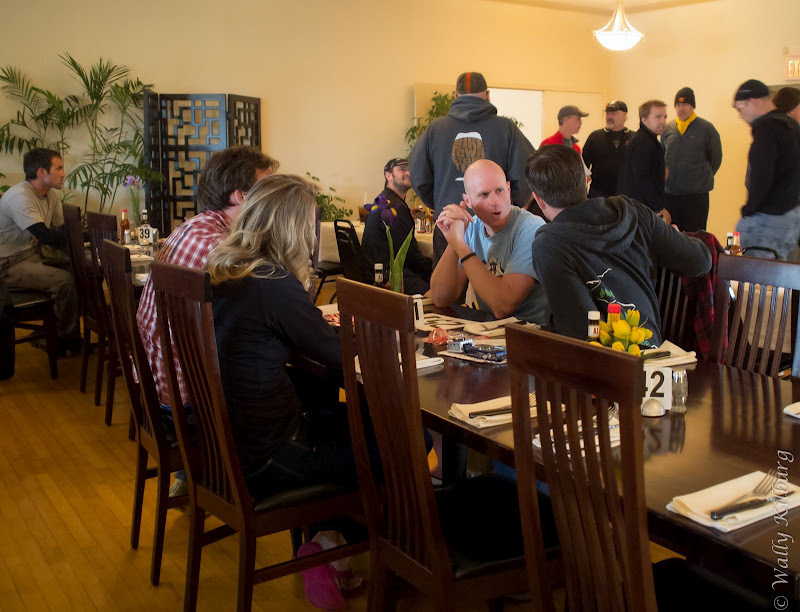 I don't even count all of these types of events as being fodder for GGN, (must have half the course as gravel or dirt road), but the point is, these are the events that seem to be gaining ground now with cyclists and adventurers alike. All that to say that, in my opinion, this is becoming a significant bit of the cycling populace. Generally, where there are grassroots, the hardware follows. I think this is going to happen slowly, but I do think it is going to happen. I know that tire makers are into it- Clement and Challenge to name two- but bicycle companies are starting to take notice too. I know a few things that are rumbling in the background for bikes, and I'm sure there are things I don't know about as well. Of course, HED Wheels also jumped in with their offering, and I suspect we'll see a bit more in the wheel department from others touting certain wheels as being good for things like gravel roads. So, I look for more developments in the coming months and years. The folks are out there doing this specific kind of riding on all sorts of equipment, and that's good. The marketing to them will follow. Of course, many will ask "why do these folks need anything else?". The answer is that they do not need anything specifically built for gravel riding. Just like you do not need a specific bike for mountain biking, road riding, or for hauling groceries home, but as we know, those bikes not only exist, but have sub-species that run on for days. So "need" is a moot point. Making the experience better? I think there is room for improvement there, and we'll see what manufacturers do, or do not do, to enhance the gravel riding experience. Okay, so if you are following along, yesterday I talked about these FSA rings and how I was going to try out a 2 X 10 set up on the titanium Mukluk. In this post I'm going to follow up after my first ride on the set up happened yesterday during my commute to work and back. The deal here, to quickly recap, is to make it so you can turn a triple crank into a double, yet have the optimized chain line that dedicated double only crank sets achieve. This is accomplished by offsetting the 36T and 22T rings 1.5mm to the outboard side of the crank. The fact that you have a triple crank is masked by FSA's clever little "ears" that mount on the outboard side of the spider, giving you a clean look. Okay, so now that I've covered this, here are the conditions I got to ride in yesterday. Wettish, slushy snow. It was still spitting these little ice balls from the sky. The deeper snow was very wet, if it wasn't packed in, and then it was solid as a rock. I definitely needed to use most of the entire gearing range. The FSA chain seemed to be a bit grumpy and not very "happy" to be meshing on teeth right away, but this quickly subsided. By the time I was coming back home it was smooth as silk. It shifted very nicely on both ends. Gear ratio: The taller front drive ring was a bit of a concern at first, but I think the 36T is acceptable. I really like having the 22T on the bike for the deeper, slower "trundling" necessary to traverse the slush and deep snow. The bigger ring also extends the range on the high side, which I appreciated on the long downhill section coming home. The Snow Dog spins out on this frequently. By-Tor, the Titanium Mukluk got a make-over. I was not enamored of the single speed deal for slogging it through snow, (and now mud), so that was ditched in exchange for a greared set up again. Only I did not do the 1 X 10 set up, as before. Nope. I went in a bit of a different direction. I have a 2 X 9 set up on the Snow Dog, and that's been a great set up for almost anything this winter. Actually- it's just been a really great set up ever since I switched from a standard triple. So, when the opportunity came up to redo the titanium Mukluk, I went 2 X 10. On the Snow Dog, my "chain line" measurement, (from the center of the seat tube to the center line of the big ring), is 70mm. That's using an Origin 8 Sub-Compact crank, which is now available as a Dimension crank, I believe. Anyway, it is a crank with an offset spider to the outside by a millimeter or two to optimize the chain line for 2X usage. I came across some FSA rings that can be mounted on a standard 104BCD crank, and these rings are offset slightly to offer a similar effect as the Origin 8 cranks I have do. Interestingly, FSA has these little "ears", or tabs, that you can use to flesh out the look on the outer side of the crank, so it does not appear that you dropped a ring off a triple. I also used these, which ended up looking great with my old ISIS Bontrager crankset. The outer ring is a 36T and the inner is a 22T. The offset is 1.5mm from standard, so not much, but every little bit is welcomed on a fat bike, and more importantly, this makes a triple crankset work like a double crankset is designed to work like. No compromises in chain line or on front derailleur set up. I mounted that all up, and I measured again. 69mm chain line, so very close to the Origin 8, and they could be dead on the same considering variances. Did you know FSA makes chains too? I did not until I got ahold of this one. 10 speed specific, of course, and it connects with pins, but I hear a quick link is in the works for future chains. Astute viewers will note the SRAM front double ring derailleur and the rear Shimano Shadow plus derailleur. Shifters are similarly mismatched. Rear shifter- Shimano, front- SRAM. It'll work fine. Besides the drive train, nothing else has changed on the bike. I probably will look for a Nate or two soon for slop riding though. Speaking of slop- It is going to get messy for awhile out there due to all the rain, slush, and with warmer temperatures, frost coming up out of the ground now. There are a few challenging spots on my way to work, so expect a muddy mechanic for the next week or so!